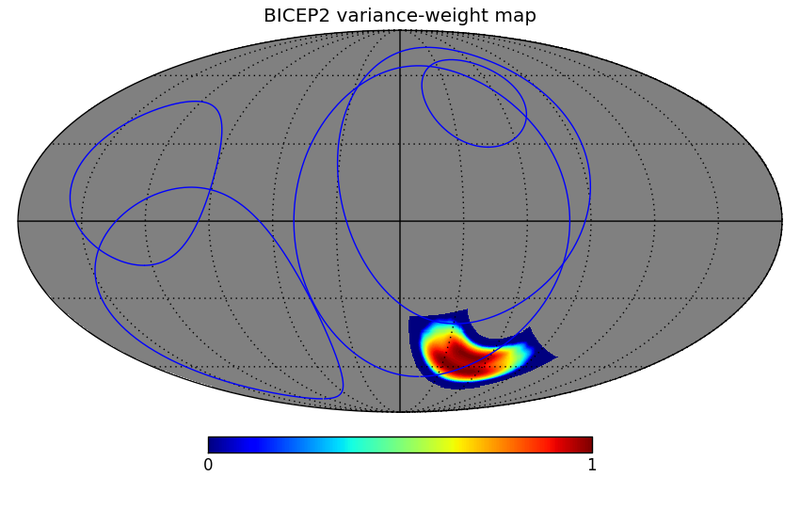 Planck versus BICEP2: Round One! You may recall my scepticism about the recent announcement from the BICEP2 experiment about evidence from polarized microwave emission for the existence of primordial gravitational waves generated during a period of cosmic inflation. 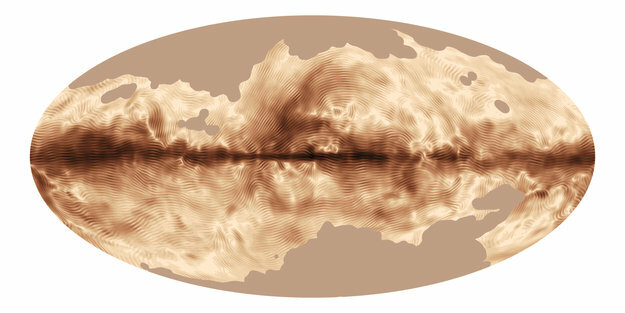 This paper presents the large-scale polarized sky as seen by Planck HFI at 353 GHz, which is the most sensitive Planck channel for dust polarization. We construct and analyse large-scale maps of dust polarization fraction and polarization direction, while taking account of noise bias and possible systematic effects. We find that the maximum observed dust polarization fraction is high (pmax > 18%), in particular in some of the intermediate dust column density (AV < 1mag) regions. There is a systematic decrease in the dust polarization fraction with increasing dust column density, and we interpret the features of this correlation in light of both radiative grain alignment predictions and fluctuations in the magnetic field orientation. We also characterize the spatial structure of the polarization angle using the angle dispersion function and find that, in nearby fields at intermediate latitudes, the polarization angle is ordered over extended areas that are separated by filamentary structures, which appear as interfaces where the magnetic field sky projection rotates abruptly without apparent variations in the dust column density. The polarization fraction is found to be anti-correlated with the dispersion of the polarization angle, implying that the variations are likely due to fluctuations in the 3D magnetic field orientation along the line of sight sampling the diffuse interstellar medium. We also compare the dust emission with the polarized synchrotron emission measured with the Planck LFI, with low-frequency radio data, and with Faraday rotation measurements of extragalactic sources. The two polarized components are globally similar in structure along the plane and notably in the Fan and North Polar Spur regions. A detailed comparison of these three tracers shows, however, that dust and cosmic rays generally sample different parts of the line of sight and confirms that much of the variation observed in the Planck data is due to the 3D structure of the magnetic field. We’ll have to wait until later this year to see what’s going on in the masked regions (i.e. far above and below the Galactic Plane, where the dust emission is presumably weaker) and indeed at the 7 other frequencies measured by Planck. It’s all a bit of a tease so far! In March 2014, scientists from the BICEP2 collaboration claimed the first detection of such a signal in data collected using a ground-based telescope observing a patch of the sky at a single microwave frequency. Critically, the claim relies on the assumption that foreground polarised emissions are almost negligible in this region. Later this year, scientists from the Planck collaboration will release data based on Planck’s observations of polarised light covering the entire sky at seven different frequencies. The multiple frequency data should allow astronomers to separate with great confidence any possible foreground contamination from the tenuous primordial polarised signal. P.S. It’s gratifying to see the Planck Collaboration have used extragalactic Faraday Rotation measures to probe the Galactic Magnetic field as I suggested on this blog not long ago. The article that first advocated doing this with CMB maps can be found here.